The May/December trope is one that Racheline and I keep coming back to. Sometimes, it happens almost accidentally; as cowriters, we are sixteen years apart in age, and having characters with a large age gap between them lets there be a character we each relate to. Sometimes, we do it more deliberately: We’re interested in how people navigate power dynamics within relationships, and how a couple navigates disparities in age, experience, and expectations. 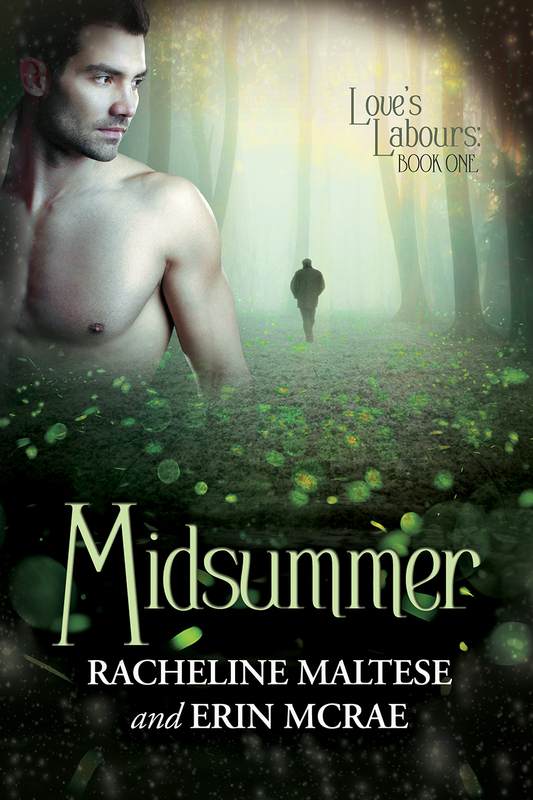 In Midsummer, the May/December relationship between John and Michael is a little different than other age-difference stories we’ve written, because it is also a gay-for-you romance. Michael — who is twenty-five — has been out and proud since he was in high school. Forty-two-year-old John, on the other hand, has never found himself attracted to men until he falls in love and lust with Michael. He insists that his attraction for Michael isn’t some sort of mid-life crisis; although he totally gets why his friends accuse them of that. As much as we enjoy writing May/December for the fun of watching a character teach another something awesome in bed, we also enjoy the negotiation and conflict that arise when two characters are so far apart in age. And in Midsummer, the gay-for-you dynamic interacts with the May/December dynamic in ways we really enjoy. On the one hand, John is seventeen years older than Michael, and has a great deal of experience with life, the world, and relationships. On the other hand, John is very new to being a part of the gay community, and has to learn how to navigate questions of his own outness. This entry was posted in books, Love's Labours, Midsummer, Writing and tagged bisexual romance, books, gay romance, love's labours, midsumer. Bookmark the permalink.